Driving south on Interstate 95 through Maryland, eventually you come to the I-495 interchange near College Park. If you stay on I-95, then for the next little while, you also are on I-495, the Capital Beltway; the routes are concurrent, sharing the same physical road. Farther along, in Springfield, Va., the two routes part again; if you stay on I-95, you are not also driving on I-495 anymore, but the distinction is pretty meaningless. All along, you were just driving on a road in a direction; it could be called anything. 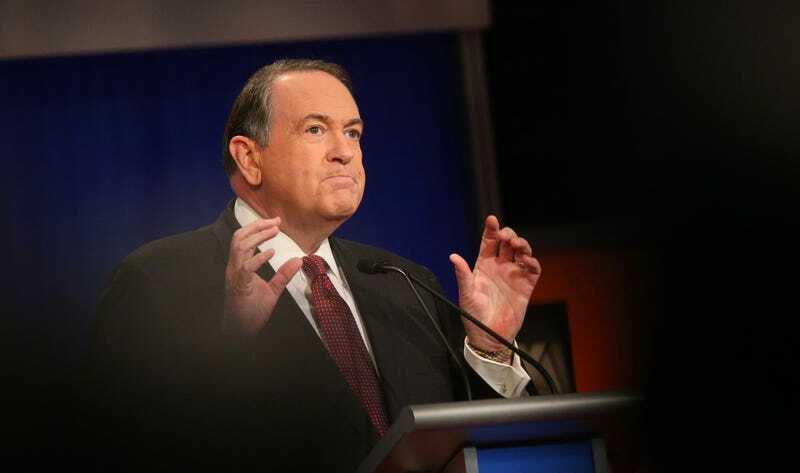 Mike Huckabee left the Republican presidential nomination campaign yesterday. In virtually all respects, I can’t imagine this will change things very much for the former Arkansas governor, whose job is showing up to places where other people will pay him to say exactly what you know Mike Huckabee will always say, and who was happy for that to be called “campaigning for president” for a while. Maybe the crowds will be smaller, or no television cameras will be present, or he will be a pundit talking about the candidates, rather than a candidate being talked about by pundits. In any case, Mike Huckabee will do what Mike Huckabee does: He stands in front of people, and says what they have come to hear Mike Huckabee say, and gets paid for it. Of course he is a con—he could scarcely be bothered to pretend he was actually seeking office in 2008, when he had a hell of a lot better chance than in 2016—and yes, of course, in the abstract, a con is a bad thing to be. I can’t get mad at Mike Huckabee, though. Oh, sure, his ideas are revolting, he’s a bigot and a demagogue and a charlatan and a grotesque grandstanding opportunist and all that, he reduces Christianity to a deodorizing spray for rank ignorance and entitled stupidity, and so on. Yes, yes, yes. On the other hand, him running this con for cable news network cameras probably works out better for pretty much everybody, since the alternative almost certainly involves him bilking kindly old ladies out of their pensions and/or selling predatory mortgage schemes during Judge Judy commercial breaks. Would it be better if he did something worthwhile with his time, his affability and (yes) charisma, his evident skill as a salesman and speaker? Sure, I guess. Probably it is enough to be glad his route will never take him to the White House, because it was never intended to.